52-goal striker Ollie Maltby celebrates another Pinchbeck goal. The irresistible force really does meet the immovable object in a PFA Senior Cup semi-final tomorrow (March 25, 2pm). 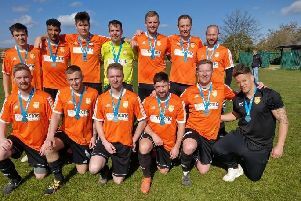 Peterborough Premier Division leaders Peterborough Sports Reserves made it 19 league wins on the spin with a 3-1 success at Ketton last Saturday (March 18), when second-placed Pinchbeck United recorded consecutive win number 17 by seeing off ICA Sports 3-1. Ian Bradbury (blue) scored twice for Peterborough Sports Reserves at Ketton. Sports were the last team to beat Pinchbeck in a league game on August 20. A week earlier the city side had suffered their only defeat of the league campaign when losing 5-4 at home to Langtoft. The teams clash at Knight Street in their cup semi-final tomorrow and then lock horns at PSL in what could be a title decider on Tuesday, April 11. “They are two remarkable runs of form,” Sports manager Andrew Bradley stated. “It looks like we are the best two teams in the league so it should be a cracking cup tie. “We’re under no illusions about how hard it will be. We won at Pinchbeck earlier in the season, but Ollie Maltby (the division’s leading marksman) didn’t play that day. “We’ve also changed our team since then. We look stronger, but I just hope we have a few more players available. “I’ve had to play in the last two games which is not ideal! Ian Bradbury (2) and Gary Gibbs scored for Sports at Ketton, while Maltby struck twice for Pinchbeck against ICA to take his goals tally for the season to an outstanding 52 in 27 outings. ICA Sports host First Division Warboys Town in the second semi-final at Ringwood. ICA fell at this hurdle last season and they won’t find it easy against a Warboys side riding high in Division One with just two defeats in 20 matches. Warboys warmed up with a 4-3 win over Oundle Town last weekend. Premier Division: AFC Stanground Sports v Stamford Lions, Holbeach United Res v Langtoft United, Netherton United v Leverington Sports, Sawtry v Ketton, Stilton United v Moulton Harrox, Wisbech Town Res v Thorney.